Ty Seager kicks the ball upfield. The sophomore forward and the Wildcats will take on Michigan State on Friday. With just three games remaining in the season, it’s crunch time for Northwestern. The Wildcats (5-9, 1-5 Big Ten) will put their three-game win streak on the line Friday when they welcome No. 9 Michigan State (10-2-2, 4-0-2 Big Ten) to Evanston. NU will need to pair the attack that produced eight goals and has powered the Cats to three straight wins with a conservative defensive strategy. It will need to capitalize on a slower pace that kept NU in close games against some of the top teams in the country earlier this season. The Cats will host the Spartans on Senior Night under the lights at Martin Stadium. 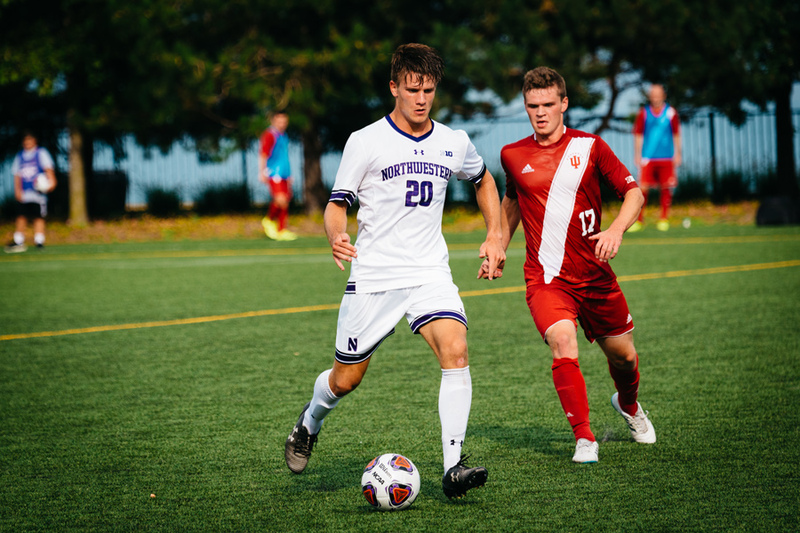 A pregame ceremony will honor NU’s four seniors — goalkeeper Francisco Tomasino, defender Riley Kelliher, forward Elo Ozumba and defender John Moderwell — before the Cats try to extend their longest win streak since 2013 and upset one of the top teams in the country. NU took home its first conference win of the year in a 3-0 shutout over Rutgers at home on Sunday. The Cats are looking to ride the offensive momentum of Sunday’s win into Friday night, freshman defender Garrett Opperman said. Michigan State boasts one of the top defenses in the country; the Spartans have allowed their opponents only eight goals in 14 games, the second-best goals against average in the Big Ten. Goalkeeper Jimmy Hague is tied for the second-most shutouts in the country this season with nine. While the Spartans’ defense poses an obvious challenge for the Cats, the Michigan State offense presents an opportunity. The Spartans have scored only 17 goals on the season, while NU has scored 15. Lenahan said Friday’s result will be imperative to the Cats’ postseason ambitions. Michigan State is the fourth team the Cats have lined up against that has been ranked No. 1 at some point this season. NU will benefit from the lessons learned against that level of competition earlier in the season, Buescher said, especially during Friday night’s final home conference matchup.